Lavinia house was built in the 1850's, and although retaining its character and features of the original dwelling it offers the comfort and standards expected in a well modernised guest house. The house is situated at the top of the Khyber pass and enjoys views of the sea, is close to all local amenities and offers friendly, relaxed hospitality to all guests. Whitby's skyline is dominated by the ruins of St. Hilda's Abbey, high on Whitby's East Cliff. Spreading below Whitby, a maze of alleyways and narrow streets run down to the busy quayside. Whitby is situated on the Yorkshire Coast. To the south lies the coastal villages and resorts of Ravenscar, Scarborough, Filey and Bridlington. All these are well within a short drive from Whitby. Parking in Whitby is no longer free, all though our guest can park in the zoned parking areas (out front, down the Khyber pass and the three hour disc parking zone) with a permit which you can get from us for a small fee. You will need to display the permit on your dash in the car. There may be times in the summer were you may have to park in a pay and display car park of which there are several near by. Small ground floor room with En-suite. 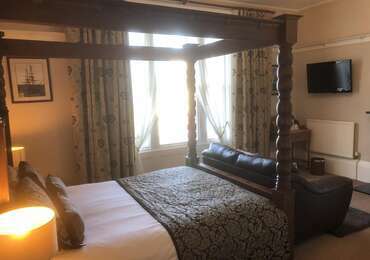 Large ground floor room with King-size Four-poster, En-suite, sea views, leather sofa and large flat screen tv/dvd player. 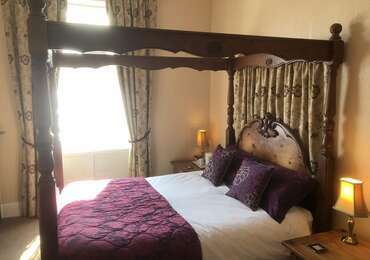 Four-poster Room, En-suite Shower/Bath, flat screen tv/dvd player.